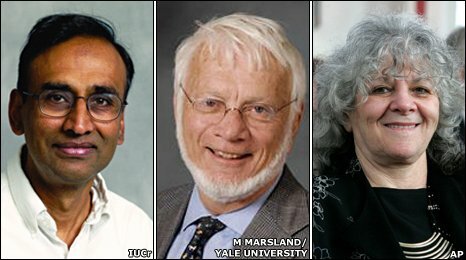 The 2009 chemistry Nobel Prize has been awarded to Venkatraman Ramakrishnan, Thomas Steitz and Ada Yonath. The prize is awarded for the study of the structure and function of the ribosome - the cell's protein factory. The ribosome translates genetic code into proteins - which are the building blocks of all living organisms. 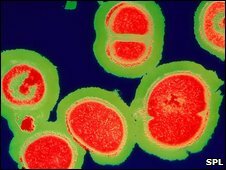 It is also the main target of new antibiotics, which combat bacterial strains that have developed resistance to traditional antibiotic drugs. These new drugs work by blocking the function of ribosomes in bacterial cells, preventing them from making the proteins they need to survive. Their design has been made possible by research into the structure of the ribosome, because it has revealed key differences between bacterial and human ribosomes. Structures that are unique to bacteria can be targeted by drugs. The announcement was made during a press conference at the Royal Swedish Academy of Sciences, during which the three winners were described as "warriors in the struggle of the rising tide of incurable bacterial infections". Professor Ramakrishnan is based at the Medical Research Council's Molecular Biology Laboratories in Cambridge, UK. Thomas Steitz is based at Yale University in the US, and Ada Yonath is from the Weizmann Institute in Rehovot, Israel. The prize is to be shared equally between the three scientists, who all contributed to revealing the ribosome's huge and complex molecular structure in detail. Professor David Garner, president of the Royal Society of Chemistry, described the three as "great scientists" and said their work was of "enormous significance". 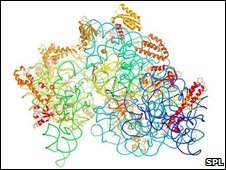 These scientists and their colleagues have helped build a 3D structure of the ribosome. In doing so, they solved an important part of the the problem posed by Francis Crick and James Watson when they discovered the twisted double helix DNA structure - how does this code become a living thing? DNA is made available to the ribosome by "transcription" of genes into chunks of messenger RNA. In the ribosome, these are read and translated into the various amino acid sequences that make up an organism's proteins. By looking closely at its structure, scientists are able to study how this translation process works. The work is based on a technique called x-ray crystallography - where molecules are removed from cells, purified and made into crystals that can be examined using x-rays. Professor Ramakrishnan told BBC News that until the ribosome's atomic structure was determined, "we knew this was a large molecular machine that translated genetic code to make proteins, but we didn't know how it worked". "We still don't know exactly how it works, but we have made a tremendous amount of progress as a direct result of knowing what it looks like. "It's the difference between knowing that when you put gasoline in a car and press on a pedal, it goes. But if you know that the gasoline gets ignited and pushes down pistons and drives the wheels, that's a new level of understanding." Addressing the Nobel press conference by telephone, Professor Yonath said that modern techniques were allowing scientists to look at the structures on the atomic scale - individual bond after individual bond. This is the 101st chemistry Nobel to be awarded since 1901, and Professor Yonath is only the fourth woman to win. She joins an illustrious list of female chemists that includes Marie Curie, who also won the physics award. During the press conference, Professor Yonath said: "It's above and beyond my dreams and I am very thankful." President of the American Chemical Society Thomas Lane told the BBC that the award was "a wonderful example of leaders in their disciplines - people from around the world - working towards a common goal and being able to achieve it. "It shows that as scientists we don't just sit in our dark labs, we come together and share our research." Professor Ramakrishnan paid tribute to the many generations of talented researchers who he said had contributed to this entire field. Some scientists have commented negatively that the research recognised by this year's chemistry Nobel has a biological focus. But Professor Garner pointed out that "when you get down to looking at biology at the molecular level - understanding the fundamental processes of life - it's all chemistry". Professor Ramakrishnan said: "Ultimately, when you look at any biological question it becomes a chemical problem, because bio is done by molecules and molecules use chemical laws." He concluded: "It's often the way with science that people study fundamental problems, like the ribosome, and they lead to important medical applications in completely unpredictable ways. "It's important to realise that support for basic science is the seed that allows the medical applications and technology to grow."